Android boxes are extremely popular home multimedia accessories. 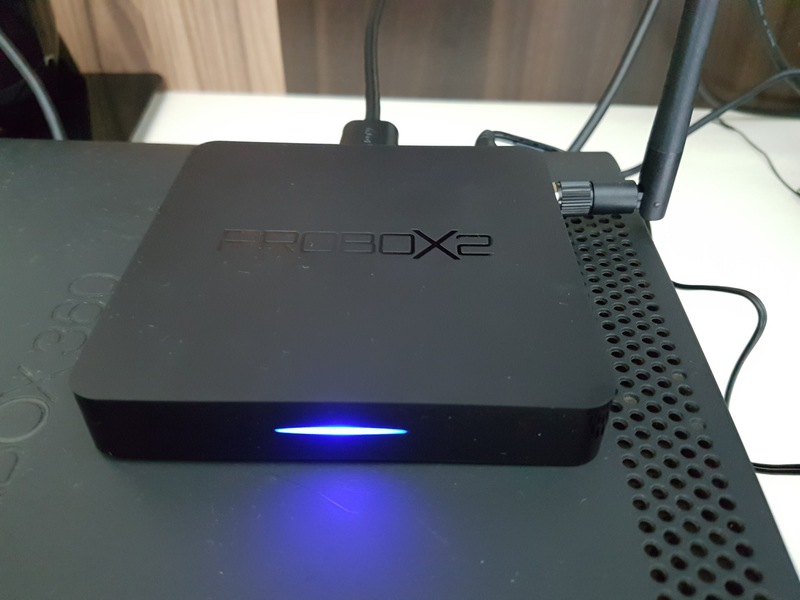 The Probox2 Air is a TV box with a relatively new Android build (6.0), dual band WiFi and the like. These Android boxes pack a punch in terms of playback capability, and with the breadth of content in the app store (and other sources), it’s an convenient way to add content for your home entertainment. It’s a compact Android box, that’s even smaller than the footprint of a cd case, if you still happen to have those lying around. The build quality feels good, no rattling noise and feels stable with its rubberized base when placed on your TV console. The ports are located to the back and side, with a blue LED activity light located at the front. The Probox2 Air comes with a power adapter, a short HDMI cable (about 50cm), and an IR remote. There’s an external antenna on the Probox2 Air, which is a welcome addition for better connectivity. The Probox2 also has dual band WiFi and Bluetooth, which is a strong advantage over similar boxes. Why is this important? Previous chipsets that relied on 2.4 GHz WiFi only, often see poor Bluetooth and Wireless performance as both operate on the same spectrum. The Probox 2 runs on the Amlogic S905X quad core CPU, with 2 GB DDR3 RAM and 16GB internal storage. There’s only 2 USB ports, which is easily used up with an external drive and a remote. The Probox2 Air runs on Android 6.0 which is great as it allows for Adoptable Storage, plug in a SD card / thumb drive, USB Hard disk, and the OS is able to configure it to be recognized as internal storage, which would be transparent to your apps. Powering on the Probox 2 Air, there’s a simple setup wizard to configure your language, network, etc. It runs on Android 6.0.1, and OTA updates are promised. There was a pending update when I turned on the Probox2 Air, and it updated easily. I am not sure if it would ever see Android Nougat on this box, I wouldn’t exactly keep my hopes up. 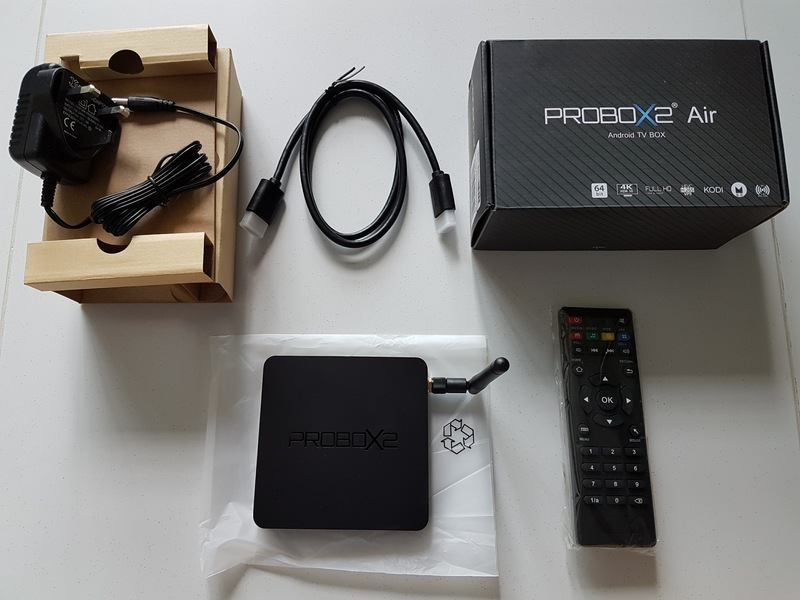 The Probox2 Air is pre-loaded with applications such as Kodi 16.1 (with popular add-ons and repositories added). There’s also AirDroid, Fishing Joy, Happy Cast, Netflix, and YouTube. These can be uninstalled, but would help you get up and running, especially if you aren’t too familiar with Kodi. 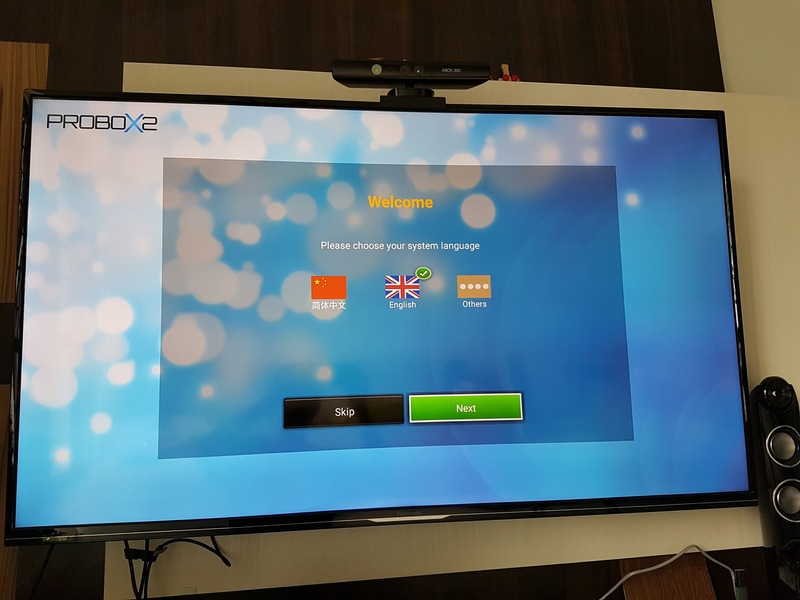 For Asian content, there’s a whole bunch of China-based Android apps that you can install to get their latest streaming or IPTV content. Hint: look on Facebook for Android TV Box groups, if you need help getting these APKs. The Probox2 air comes with two launcher options, Probox2 Apex UI and Probox2 EX, with the latter having even bigger icons. The launcher is customised by Probox but the theme is a little gray and dreary to me. However, it’s clean and easy to navigate. Video performance on locally stored files seems to be strong, with support for a range of 4K videos. If you are looking for Netflix, only SD is supported though. Netflix limits 4K support to specific devices. 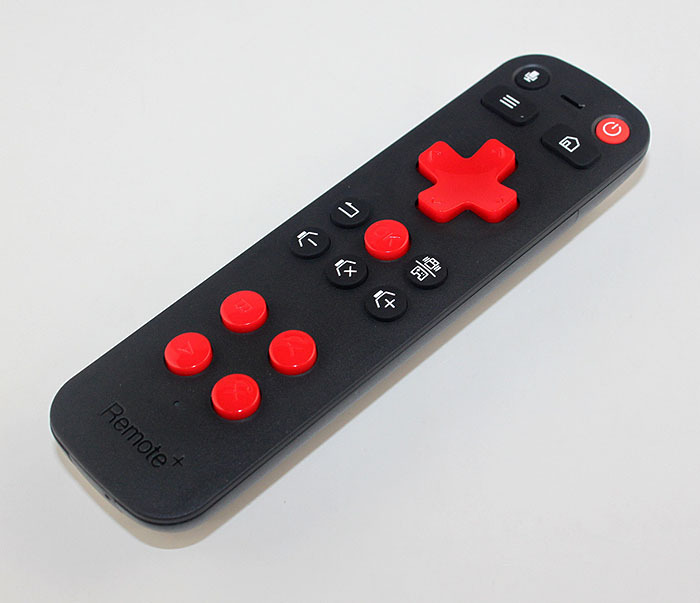 The remote is simple and straight forward to use, good for those accustomed with traditional TV remote. There’s a more advanced remote available for purchase. The Remote+. It uses one USB port, as it operates on 2.4 GHz wireless. It has a six-axis gyroscope & accelerometer, so you can wave it around – an air mouse basically. There are other modes, and 4 gaming buttons, allowing it to double up as a gaming controller when in a pinch. There’s also a built-in microphone, which when working, it was quite useful to have Google Search (voice) for my TV. However, there wasn’t any clear indication of when the microphone is ON on the remote, and I had some difficulties getting it work. 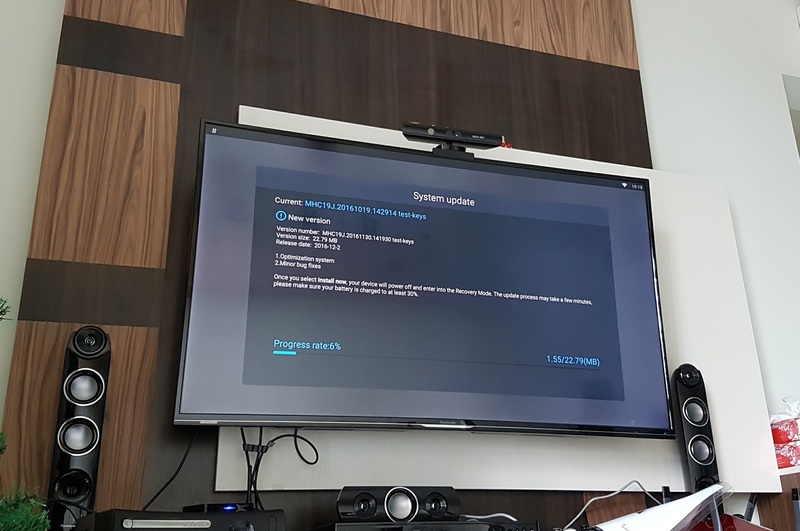 A stable Android Box, with decent performance and comes with Android 6.0.1. There’s Kodi included, and the included remote works fine. It retails for US$89.99 at W2Comp or you can buy in from Amazon as well. It’s priced on the high end, but does come with Dual Band Wifi and is also better than other boxes in terms of included software, and launcher features.